I first became aware of Larissa Szporluk’s poetry in 2004, when one of my graduate school professors, the late-Jake Adam York, mentioned her as someone he considered to be one of the premier, contemporary poets writing at the time. Specifically, he directed me to her third, full-length collection of poetry, The Wind, Master Cherry, The Wind (Alice James Books, 2003). Yes, just as Ferdinand Magellan’s circumnavigation of the globe altered humanity’s spatial relationship to/of the world during the sixteenth century–literally changing our notion of what “up and down” meant–Szporluk’s poems changed the manner in which I conceived of both language and poetry at a time when I was primarily familiar with the canonical and anthologized poems taught in literature courses. More than a decade ago, then, her poems acted as a literary and poetic passage that was theretofore uncharted for me. Such violence manifests itself again and again throughout Traffic’s representations of the natural world, as seen in the wind that “leaves a deep pocket / of dusk in your scalp” (3), a ladybird “carcass / on a snow-white beach” (7), or the image of an “eye of the cat-torn mouse” (41). I cooked my little children in the sun. I threw grass on them and then they died. in adjoining rooms around me. Indeed, something as mundane as sleeping on one’s arm so as to cut-off circulation, thus inducing that “pins-and-needles” feeling, offers us a meditation on death that confers upon us the understanding that “being dead, is easy”—at least to the extent that its specter is ever-present and always near. 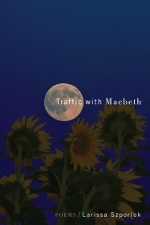 To this end, I think, the purpose of Traffic with MacBeth’s violence is to provide us with a heightened awareness of the fragility of life; and, thus, instills within us a greater appreciation for our brevity. Last night the poets Luke Bloomfield, Brian Foley, and Wendy Xu passed through Cleveland, OH on their Moonbucket reading tour in promotion of their books Russian Novels (Factory Hollow Press, 2014), The Constitution (Black Ocean, 2014), and You Are Not Dead (Cleveland State Poetry Center, 2013), respectively. Below are three short video clips of each poet performing at the event, which took place at Guide to Kulchur. Their tour, which has also taken them to Philadelphia, Baltimore, and Akron, will continue tonight in Buffalo, NY. In “How It All Fell Out,” the final poem of Gin & Bleach—Catherine Wing’s second full-length collection of poetry—the speaker observes how the “mouths” of an unspecified “they”: “stretched as if to say open, they were outspoken, they let the light pour through, and the air pour through, and that which was neither light nor air they were open to” (57). This passage, I think, provides a productive way to conceptualize Wing’s poems: open mouths that consume the world around them, whether it be in the form of “light” or “air” or that which is “neither,” in order to, later, articulate that aforementioned world in an “outspoken” fashion. In other words, the poems function similar to breath, wherein the speaker inhales her surroundings so as to exhale them. The exhalations find their form, most notably, in song. Yes, everywhere there is song: the “song of oyster-shell,” the “song of sifted flour,” the “song of meadowlark” (47), the “Song sung of a splash” (26) by a tadpole, the “Cobbled Song,” the “Death” song, the “Night Song,” and any number of the “Counting Songs” found throughout Gin & Bleach. The songs that we hear “swinging on a string of sound” (23) within Gin & Bleach are more than just pleasant music—though they are that as well; but, indeed, they also search or strive for something more, which is ineffable, ethereal, and protean. Stated differently, these poems are “searching the lexicon // for a soul” (28): something to guide and direct us, however vague or amorphous that concept may be. This, of course, is no easy task, because “Language,” as Wing writes, “is, at best, a guessing game” (15) wherein we can only really know “somewhat what” (14) we think we mean to write. Which, I take to mean, we never really know what we mean to write, even if we mean something that we think we mean; which, yes, could mean that we mean nothing at all. Similar to when “birds unlace their songs” (4) into the atmosphere around us, we think less about what their songs mean, and, rather, simply enjoy the beauty of their music. To this extent, what I enjoy most about Wing’s collection is the ability of the poems therein to straddle that line between meaning and non-meaning, sense and nonsense, all in service of the song. Upcoming events for the Poets of Ohio reading series include Matt Hart (02.06), Heather Christle (02.13), Dave Lucas (03.18), Tyrone Williams (03.27), and Larissa Szporluk (04.10) For more information on these events, check out the following Internet Web-Page.